I was alone painting the walls of my new living room. I had beautiful piano music playing in the background, and in that moment I felt so stirred to worship. I was flooded with all the prayers, trials, and exhaustion that culminated into this little cottage that now bares our name. This was a gift. A gift from God above. With each stroke of the brush, I whispered "thank you". This small house means so much to our family. When we moved to this city two years ago, we were desperate for a new beginning. We needed a touch from God. We were knee-deep in the dark valley of sickness. We were unsure and a bit timid for the future. We were alone. It was just our little family embarking into the unknown trying to make a life for ourselves. There were many sweet moments and many difficult moments. In many ways it was like starting over. For two years, life has sort of been in this state of limbo. Our home still sat on second street, but strangers were living there. Our lease in the city required routine thinking about renewing or moving. We filled moving trucks, we emptied moving trucks. We made some friends, we said goodbye to some friends. The big boy began school, the little boy began talking. Change of addresses, maps to new jobs, and being strangers in church were just a part of the new life. God was faithful. We grew into a better family. We loved each other more deeply. We trusted God more wholly. We cried a few tears, but love always grew deeper with each day. 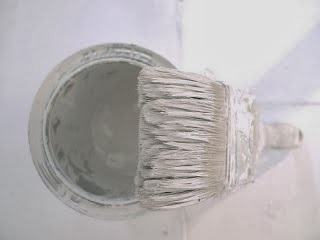 When I put more paint on my brush, I saw a glimpse of those past months and could only utter, "thank you". We don't deserve the blessings that are given, but we are grateful. This little place to put down a few roots means so much to us. The way in which it all happened, and the feeling of God's good gifts were a bit overwhelming. With every wall and baseboard being touched with paint, I prayed. I asked God to bless these walls with laughter and love. I asked Him to bring friends and family through the doors. I asked Him for this little cottage to be a light in this corner of the city. I asked Him to help me share this gift the way He intended me to. I poured my heart out to Him in thanksgiving. Bless these floors underfoot that they may provide shelter from the cold world. Bless these stairs that little feet climbing might grow into Godly young men. Bless this kitchen that love might be served with each meal. Bless this fireplace that warmth would be felt to all who may enter. Bless this bedroom that our marriage may grow in love in grace. Bless these closets that I may see the big picture and not worry so about accumulating things, but freely give. Bless this laundry room that I might be reminded of God's good gifts of provision. Bless the yard that good fruits may grow. Bless these porches that sweet music might be shared and many good stories heard. Bless this house.....so that it can be a blessing. Bless our lives, so that we can show your love and blessings to others. I could feel the embrace of my Savior, and I heard His still voice calling to my heart to....Enjoy this. It has been another particularly hard few weeks. I am generally the eternal optimist, but I am struggling with that as of late. My husband is not well. The past two years of his health struggles is starting to take a toll on my resolve regardless of my efforts. I will not go into deep detail, but he is quite ill. We are trying to find any way to make things better. Some days I feel we are winning the war. Other days, I wonder if there will ever be a victory? It is hard to watch someone you dearly love suffer. It is hard when you are unable to fix the problem. It is hard when you can't decided if the doctors are helping or hurting. How long will the struggle last? Will life ever go back to normal? Will he get well? It all is just plain hard. I sometimes get angry. I never used to get angry. But, I fight feeling that way some days. I am angry that the body is so frail. I am angry that he is so young to have these struggles. I think about our children being just babies. We are facing things that people twice our age do not face. I grieve what we have lost. I grieve what we may not have. I suppose that is normal. I get frustrated because I think maybe I should have not returned to the classroom. Maybe if I could devote all my energy to our family and his health that we might be in a better place? I get frustrated at myself for being frustrated. I do not know the best plan. I do not know the best way to help our family. I am supposed to be a help-meet, but I am stumbling around amid my best efforts. I talk to God. He comforts me and strengthens me. Sometimes, I can't decide if I am doing a good job listening to His leading, or if I am just swerving away on some alternate course. I can only live each day as it is given. I can only operate on a moment by moment basis. I have surrendered to the fact that I am totally not in control. My best is always going to be a mess. I know little of God's ways. I do trust Him. I trust His promises. I trust His word. I am surrendered. I am not defeated. The last few weeks of the old year allowed me to see things a bit differently. In the midst of the unknown, God blessed us with a home to purchase. We celebrated ten years of marriage. I finished the semester at school with a Christmas presentation that I felt was very good work. We managed to fit gifts in for others and precious time for our family. We lit the tree. As I got in my car to return to work after the extended break, my heart was full of challenge and positive thoughts. Quickly, the positivity vanished. I sat for over an hour on the interstate trying to go a mere 10 miles. I was late. The kind of late that makes you want to crawl in a hole and sulk. It was out of my control. It was not the beginning I had hoped for. It was just enough ammunition to make me want to walk right into the office and resign. I am so tired of this feeling of inadequacy and inability to make things work. I am exhausted of feeling like life is nothing more than a dozen eggs being juggled at impossible speeds just above my head. I have hope that when I am least in control, He is most in control. I have hope that when God knows my load is too large, He will show up in mighty ways. I have the promise of hope in my future. When I look at my husband that is so frail, I have hope that God's strength is more than enough. When I see the five lanes of traffic absolutely stopped making me late (yet again beyond my control), I know that God is just as much in control then as He is ever. I am surrendered, but I am not defeated. I have hope. This year will be a year of joy and prayer, regardless of the outcome. I can say that because as long as there is breath in me, there is hope in me. I might feel like merely a survivor, but in reality....God's reality, I am more than a conqueror. So, here is to the beginning...again.